curd recipe collection. indian curd recipes. Curd or dahi is an everyday Indian food. Sometimes, it is used to make raita, curd rice and other recipes, or it is just enjoyed plain. In whichever form it is consumed, it is one of the favorite foods of people across the country. While we know our dahi by the name of curd, people in other parts of the world usually call it yogurt. Curd has many health benefits from weight loss to being low in carbohydrates. Rice preparations like Biryani and Pulao are incomplete without Raitas. Raita is a side-dish (Indian accompaniment) made using curd, vegetables or fruits or a combination of both, spices like cumin seeds powder and chilli powder. You can even enhance the flavor with the addition of finely chopped green chillies or coriander. There are basically two types of raita, sweet and savory. Raita recipes like the mango raita, pineapple raita are sweetened using powdered sugar. Palak raita, Boondi raita, Tomato raita, Phudina raita are some of the famous raitas in India. Kadhi is inseparable from the Gujarati cuisine. It is basically a wonderful sweet and spicy curd mixture thickened with gram flour. It is tempered with aromatic ingredients like cumin seeds, curry leaves, asafetida. In fact, the simple kadhi can be enhanced with the addition of pakoda, sprouts or any vegetables. Make varieties of Bhatia Kadhi, Punjabi Pakoda Kadhi, Dapka kadhi, Mooli Ke Patte Ki Kadhi from across all the communities and relish them with rice or khichdi. Peanut Kadhi is a Faral recipe had during Janmashtami. You can find many kadhi recipes using curd below. Chaats are delectable snacks made with a myriad of ingredients ranging from vegetables, chutneys, crispy snacks like sev, paapdi and puri and tongue-tickling spice powders like cumin seeds powder, chili powder, black salt. You can even perk up simple chaats wit hthe addition of dahi to make popular Mumbai Chaat recipes like Dahi Batata Puri, Papadi Chaat and Aloo Chaat. For a healthy office snack, try the Healthy Moong Chaat. We have lots of exciting chaat recipes using curds below. 1. Curd is made by adding a sample of curd (also known as curd culture, curd bacteria, lactic acid bacteria, etc.) to warm milk, and allowing the mixture to ferment in a closed container in a warm place till it sets firmly. In summer, it sets in around 5 hours; but in winter it takes longer, any time between 8 to 15 hours! 2. Curd sets faster when kept overnight in a warm place in a steel container. 3. At times, a pinch of sugar can be added to the milk before fermenting it, to make sure the resulting curd is not too sour. 4. Always cover the cultured milk with a lid, for it to set properly. 5. When adding the curd culture to the milk, make sure the milk is warm. If it is too cold, it will not set. If it is too hot, it will either curdle immediately or give you watery curds. 6. Use a whisk to combine the small curd sample with the milk, so that the sample disperses well and gives you a good thick curd. 7. The readymade ‘set curds’ available in India are often not useful as cultures to make homemade curd. So if you need a sample to make curds, try to buy natural curd from a local dairy or get a homemade sample from a friend. Curd is used widely across the world. It is relished just plain, enjoyed with toppings, made into a raita or used in other recipes. Creamy hung curd is also used to make delicious mithai like Shrikand. Many people also enjoy having a glass of plain or spiced buttermilk with their lunch. It is refreshing, cools the body and aids in digestion. 1. Curds can be made with full-fat milk or with cow’s milk. 2. Some recipes like raita and buttermilk require fresh curds, while others like dhokla, handvo, kadhi, etc., require sour curds. 3. Some recipes like Shrikand and sandwich spreads require hung curds. This is basically curd that is placed in a muslin cloth and hung from a hook or rod for at least one hour to drain the water completely. The resulting hung curd is really creamy and thick. The most popular South Indian curd recipe, Curd Rice is a great comfort food. 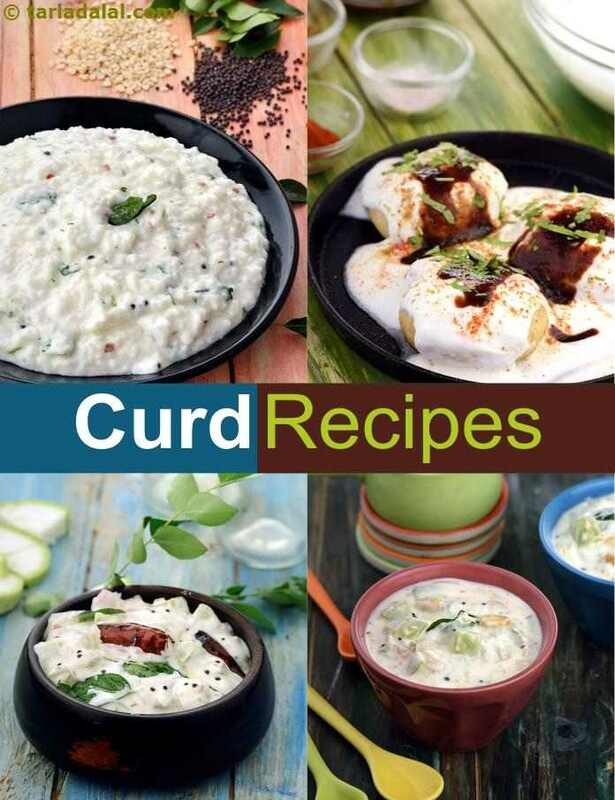 Enjoy our curd indian recipes collection below. You may find our whisked curd recipes and article on hung curds recipes useful. One of the most nutritious of all beans, chick peas (or garbanzo beans) are rich in iron, protein and folic acid. Curds and paneer enrich this tangy salad with more protein and also calcium, while coriander and mint increase its vitamin A content. Chill this salad thoroughly before you eat it. Fresh out of the garden, that is how this dip feels! The Radish, Cucumber and Curd Dip comprises refreshing salad veggies with curd and fresh cream for richness and green chillies for flavour. Chill and serve this dip with freshly-sliced crunchy veggies. Do you know how to make gujrathi katiyawadi dhaba or Hotel style dahi tameta recipe? If yes then I want it. Please answer fast and give the recipe fast.